Matt Jackson's article last week has generated quite a lot of feedback. We've picked out two pieces to feature and more comment can be found in the feedback column below. First up is Dudley Jones who thinks we should heed the warning that Alun Rossiter issued on television recently. Geoff Langley takes the opposite view and considers that Alun's comments on Sky were unprofessional and damaging. Gerard started his speedway education at the Shay in Halifax. Kenny Carter made an immediate impression and Gary Havelock remains one of his favourites to this day. Rodrigo Zubeldia	has a very colourful blog. We think he's a 50cc rider from Argentina. "Interesting comments. The suggestion of a truncated Elite League competition with clubs also competing in the Premier League has echoes of the present-day situation in Welsh Rugby. 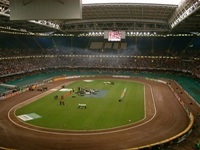 The so-called regional clubs like the Ospreys and the Newport-based Gwent Dragons attract the crowds. The original town-based club sides like Newport, Neath etc still exist but by all accounts attract even smaller crowds that most speedway clubs. " "Another well written article by Matt Jackson on the future of Speedway. Do you really think the promoters care? Let's get down to the nitty gritty. As long as they are making a buck or pound they could care less about anything else. It's a real shame about just thinking of the money and not the future. He is right Peter Collins and all the other World Class riders would arrive in a vehicle with the bike on the back. There a bunch of pre-madonna's today. You know the old saying 'SHOW ME THE MONEY'"
"I grew up near Shelbourne stadium and watched Speedway standing on the corner. No Stand, we stood on a hill. Once I had to run for shelter in the horse shed I slipped and got covered in mud. Mother was none too pleased to see the state I was in. Still happy days.I was then 10 or 12 years old." Matt Jackson was concerned by some recent comments made by Alun Rossiter - is the Elite League sustainable in its current form? 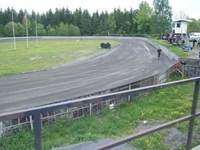 More pictures from Arnie Gibbons' recent trip to Norway, this time of the Lunner circuit in Oslo. There's a mini-track on the centre green and Glen Moi can be seen leading an 85cc race. Leandra Graves catches up with Chris Holder to look back on his win in Cardiff and ahead to the World Cup. Leandra Graves on some recent altercations between the stars of the shale. Thankfully those concerned can see the funny side. The excellent Keep Turning Left blog has added aerial pictures of many circuits to it's already varied content. Well worth a visit. The weather has forced some changes to Jeff Scott's tour dates. See left of the page for his revised schedule. Gail Cattelino is looking for info on the South Africa v England internationals in the fifties. Dudley Jones wants to know more about the Forest Flyers. Shanon Berry wonders whatever happened to Stephen Morris the former Wolves rider. "I'm sorry that I missed a line in the Tom Black story. Tom won back to back South Island Titles. After his win in 1969, he won again in 1970 from Roger Wright and Merv Salt. Then in 1971, he was 3rd... Sorry Tom!!!" "I went to the Shay quite a few times, mostly for the Dukes v Aces matches. I saw some great racing there, and the banking certainly added to the thrill. I was in the crowd when Eric Boocock parked his bike across the start line because he disagreed with the ref's decision ! Great days." "I watched my first speedway at Barrow Bombers, moved to Glasgow area in 75 and went to Paisley and saw half my old team there. I also helped out with the track staff either raking the track between races and even getting to push start Ivan Mauger when he raced there." Tracy Holmes tells the story of Kiwi rider Tom Black. Tom endured a miserable run of luck in his short British career but enjoyed a lengthy career on the tracks in his homeland. Graham Cooke from The Blunsdon Blog was part of the track staff at Cardiff last weekend. Here are some of his pictures from the event and pre-event preparations. This former Paisley Lion still enjoys the sport, but now from the safer side of the fence. Here he shares some memories from his career and his thoughts on the sport. "What a SUPERB article by Jeff Scott. I have been talking about this for years both on this Site and on the British Speedway Forum. Qualification for the SGP is an absolute disgrace. I will say only this - once upon a time EVERY Rider from the LOWEST National League Team through the Premier League to the Top Elite League Team would have started a Season looking forward to HIS chance to claim the ultimate prize in Speedway. I have mentioned many times Jack Young winning the Title as a second Division Rider. He could not do this now - instead we have to watch the so called, HAND PICKED BEST Riders in the World Race for a Prize for which a number did not even QUALIFY. Nothing to do with ability now - it's all about QUOTAS - if it wasn't - I doubt we would have a British Rider anywhere near the Grand Prix. If we didn' t have any representation - how many people would go to Cardiff. Ergo the SELECTION process. " "My first visit to Blackbird Road was as a youngster of 13 when The Hunters were the team. Fantastic racing with Harwood Pike, Lionel Benson, Jock Grierson, and many more, not forgetting Ron Wilson, the father of Ray. A fantastic racing strip which was so fair that the home team had virtually no advantage. I went back regularly in the 1960 s when the name had changed to the Lions. It was still a great circuit, and such a pity that CO sold it out to fund Brandon." "Thank you this has brought home many happy memories for me. My dad took me to see the Tigers from the age of two and i was hooked! As a teenaager Colin was one of my favourites, never a dull moment when he was riding. As you said it was not unknown for Colin and Steve to clinch the race at the last minute with us in the stands going mad screaming. We didn't need fancy staduims we had Blantyre, we had faithful fans and we had riders who gave their all every week, not for money but because the loved their sport! Great times!" An insight into the new biography of the 1980 World Champion, undeniably one of the sport's most talented (and complex) competitors of all time. 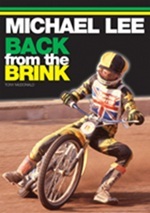 The book - Back from the Brink - will be available at Cardiff on Saturday and is also available to order online. Just a couple of days to go until the big night out at Cardiff. 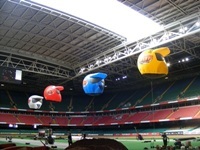 Brian Longman has given us a couple of pictures from previous years - one with the roof open and one with it shut. Jeff is a Poole fan but is now based in Northern Ireland. He's not happy with the current qualifying system for the Grand Prix series. The Sunderland Speedway website has recently been revamped but they're on the lookout for more photos from either home or away meetings. They'd also be interested in purchasing programmes or other memorabilia. Please contact info@sunderlandspeedway.co.uk if you can help. Jeff Scott is back on the road promoting his new Shale Trek book. See the left hand side of this page for his planned tour dates in July. "My take on the Gordon Parkin free transfer of Peter Craven to the Aces, its my own speculation. The Gordon Parkin 'free transfer' of Peter Craven to Belle Vue in 1952 could be called into question, based on Craven's history of speedway achievements; however Parkins actions might be viewed in context of the prevailing times. Peter Craven rode for Liverpool, primarily as a reserve and sometimes team rider in 1951, unfortunately he failed to produce team points. Quite possibly, Gordon Parkin recognized young Cravens potential was not on the big Stanley track, but his balanced racing style, being more suitable, to a smaller wider track such as the Hyde Road facility. In 1952, the Belle Vue Aces a division one team included riders such as Jack Parker, Dent Oliver, Louis Lawson, Ken Sharples, Henry Long, etc. Additionally, competing for a reserve position on the Aces, were experienced riders such as Val Morton, Dennis Parker, Ron Mason, Bob Fletcher, Norman Hargreaves, Bob Duckworth etc. It�s quite possible the team management at Belle Vue at the time, might question 'paying a transfer fee', for a rider unproven from a second division track, while already experienced race ready, talented riders were on the Belle Vue reserve books. Eventually in 1954, Peter Craven became one of the top riders on the Belle Vue Aces, and the rest is speedway history.."
"The Liverpool Chads, I think my dad, Jack, rode for them perhaps in the late 50s?" 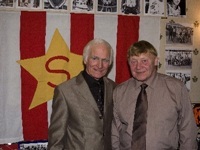 "Mike Parkins on...Gordon Parkins I am always keen to read of lost tracks and speedway history. I found Mike's recollections on Liverpool very interested in those days at Liverpool. As my heart will always be at 'The Firs' at Norwich I very much hope that Mike will do an article on his dad Gordon. Gordon was very successful at Norwich and I would love to hear more insights into this period and his later involvements. Also his early introduction to the sport, I believe I read somewhere that he first saw speedway at Barnet. There were a number of names from the past management of speedway who must have had interesting stories. Fred Mockford, Ronnie Green, etc." "Oh how I agree with Matt Jackson especially with the 'doubling up' rules and the double point tactical rule. Racers like Si Walker getting left out in the cold while other riders have two teams or the management bring in foreigners. As for the B/W tactical rule it undermines the work of the team who have got themselves a decent lead and it could be wiped out with one ride all because some riders of the opposing team are not doing so well. Let's get back to the days when two teams raced equally and happiness was 40-38." "The site is now being developed, I believe there are going to be 130 houses built, safe to say an end of an era." "I only went to Fleetwood once, and watched them paste the Leicester Hunters. I thought the track surface was like a bomb site compared to Blackbird Rd. Still, it was a decent day out." 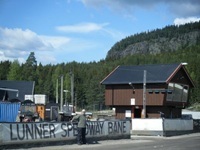 Reading Racers super-fan Arnie Gibbons sent us these pictures from his recent trip to Norway. Colin Taylor has sent us a selection of Coventry Bees pictures from the post-war era. This fan started watching the sport after uncovering a pile of old programmes and was subsequently able to blag a job on the track staff at Odsal. Bob Ferry brings us details of an upcoming social event of particular interest to those in the North-East of England. John Chaplin is arranging a memorial event for Tom Farndon on Monday 30th August at 3pm. It will take place at Tom's graveside in Foleshill cemetery, Coventry. Mike Whawell, official chaplain to the World Speedway Riders Association, will conduct the service and a number of speedway personalities are likely to attend. "Erik Gundersen was a real racer and a true gentleman. I remember racing at Cradley for Wolves at No.6 and I out gated him and could hear him all around me trying to get by. I crossed the line in front of him and after the race he came up to me and shook my hand and said what a fine ride. I have never had a rider of his calibre do that ever. Just to see his smiling face is a moment in time I will never forget. He had a beautiful attitude. Not many men would be that gracious in defeat and that showed his character." "Brilliant and a dream come true! Only dissapointment for me was in the photo section. It was World Finals I wanted to see, not British League or test matches or other Finals mixed in. The one thing I wanted to highlight was the 1973 Final, my favourite theme. Concerning the run-off; there was no mention as to why there was a run-off in the first place! That both riders had dropped 2 points. After being unbeaten at half time, Jerzy Szczakiel goes down to Grigori Chlinovski and then to Ole Olsen. Only that race is mentioned. Ivan Mauger, the defending Champion had won 4 heats but had been beaten in round 2 by Szczakiel and Pawel Waloszek. Ivan says that he wasnt surprised by Jerzy winning his first couple of heats. I wanted more from Ivan on how he made such a hash of their race. It was heat 8 and you can see it on You-tube. Ivan bunnyhops out of the gate and is last into the first corner. It takes him over a lap to pass Valeri Gordeev and then he gets on level terms with the two Poles. But he cant pass them! Jerzy beats him by 8 lengths and Waloszek 6! A great snap of this is found in the book World Speedway Final a history from 1929 by Maurice Jones, on pages 88 & 89. The caption for this is wrong as it says heat 14. Its not! Its heat 8 and you will see Ivan outside the two Poles on the Pits bend. Look closely and you will see Ole Olsen in the background watching from the Pits. For this race to be ignored is a shame because it takes away from the fact that Jerzy won the World Final by beating Ivan TWICE! How good was that? Brilliant and I'm so glad that Ivan acknowleged just how good is opponent really was. And not just on that day."